Sasha gave me a pasta maker four years ago. Back then it got a lot of use, but lately it has been sitting idle in the drawer. But tonight I am resurrecting the pasta maker and making fettuccine carbonara. There is something about making pasta - the feeling and texture of the dough, getting messy, flour everywhere - ultimately it's about having fun rolling and creating a delicious, rustic, meal by hand. It may sound daunting, but with the right tools and techniques, it's really simple and the outcome is a bowl of delicious, tender pasta that can't be beat. I make my dough using the traditional "well" method. Place the flour on a clean counter top or large cutting board and make a well in the center of the flour. 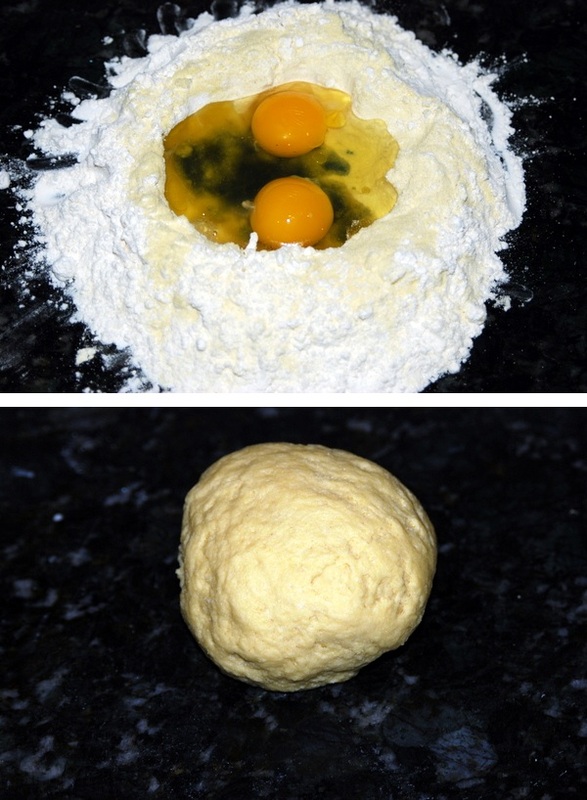 Then crack the eggs into the center of the flour and add the olive oil, salt and water. Slowly start incorporating the flour into the liquid mixture with your hands - this is a messy but fun project! I think it is important to feel the dough with your hands. Every dough is different - depending on the humidity outside, you may need more or less flour. Eventually the dough will come together into a ball. At that point, continue to knead the dough for 5 minutes, until the glutens develop and the dough becomes firm and elastic. Wrap the dough in plastic wrap and allow it to rest for 30 minutes on the counter top. If you want to store the dough for later use, wrap it tightly and place it in the fridge or the freezer. Now it is time to make the pasta. The base of the pasta maker gets anchored to the counter top, and there is a handle that you turn to feed the flattened piece of dough through the machine. There are settings on the machine that control the thickness, from 1 (very thick) to 6 (very thin). Slowly feed the dough through the pasta maker, starting at setting #1, and continue to increase the setting until you have reached your desired thickness. It is helpful to have extra flour to dust the newly rolled out ribbons to help keep the pasta from getting too sticky. Here are some guidelines: for fettuccine or pappardelle I take my dough down to setting #5, for lasagna or ravioli I take it down to #6. Once all the sheets have been rolled out, it is time to cut the dough. You can use the pasta maker's cutting blades, or else roll the dough loosely and cut using a knife - remember to have the dough well-floured when you cut it, or else it will stick. Lay the cut pasta into "nests" on a cloth towel, and once again ensure the dough is well-dusted with flour. In a large skillet, cook the bacon pieces on low heat - when golden brown, remove and set aside. Increase to medium-low, add the onion, wine, salt and chili flakes to the bacon fat and cook until the onion becomes translucent. Place the sauce on low heat to keep warm. Separate and beat 2 egg yolks in a small bowl. Chop parsley and set aside. Bring a large pot of water with 1 tbsp salt to a boil, add the fresh pasta and cook for 30-60 seconds, until the pasta starts to float. Note that fresh pasta requires very little cooking time, as compared to dried pasta. Once cooked, drain the pasta but make sure to reserve at least a cup of the pasta water. Add the pasta to the skillet, coat with the sauce and add some of the reserved pasta water. Adding the pasta water back to the sauce is one of the best tricks I have learned when making pasta. Finishing the pasta in the sauce for a minute or two helps the sauce soak into the pasta, and adding additional pasta water helps regulate the viscosity of the sauce and actually helps the sauce stick to the pasta because of the additional starch that has been released into the pasta water. Remove the pan from the heat, add the egg yolks, parmigiana and parsley and toss. The sauce will become thick as the yolks warm and mix with the bacon fat - add a little pasta water if necessary to reach the desired viscosity. Plate the pasta, top with the crispy bacon and enjoy! I love fresh pasta--we have been debating the purchase of a pasta roller. This looks fabulous. Dry pasta works just as well ;) I miss north beach and all the gourmet Italian stores! I am glad you liked the dish Deb.